I’ve added two photos of a new addition to Transas City: Zelma Rawlston, who played the role of a “swell young man” in many plays and productions. 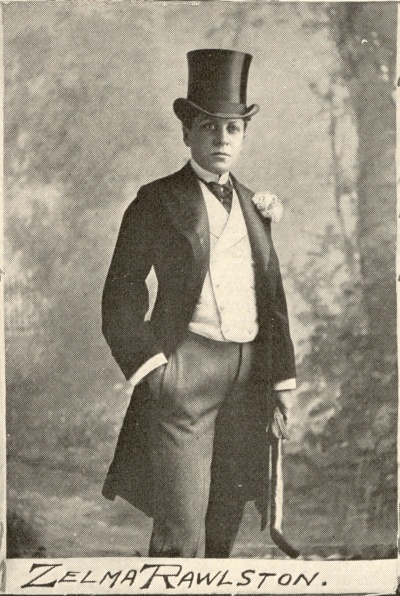 Her image in male dress caught the imagination of audiences in the 1890’s-1910’s, and she appeared on music sheets, playbills, and in many magazines and newspapers. One of the photos, showing her in 1897, is an original document that I acquired and which has now entered the Transas City collection. Based upon historical evidence it’s most likely that Zelma was gender non-conforming, rather than being transgender. But as we know, gender non-conformity is a vital part of the overall transgender awareness and experience throughout society, and many gender non-conforming persons are valued and cherished for their bravery via their public presence. Click this link to visit the new Zelma Rawlston page on Transas City. This entry was posted in History and tagged drag king, zelma rawlston on January 12, 2018 by .